You know how I love my wormy chestnut, and I love using it in different ways. I found an old board to use as a runner over a striped cotton runner I made. I actually started out with three blue Mason jars containing votive candles, then decided that was too predictable and chose family silver pieces to hold different candles. Hydrangeas from my mother's garden, Rome apples, pine cones and leaves cut from sheet music dress the old board up a bit. Vintage "Brown Drip" dinner plates by Hull are perfect for a warm, autumn table. 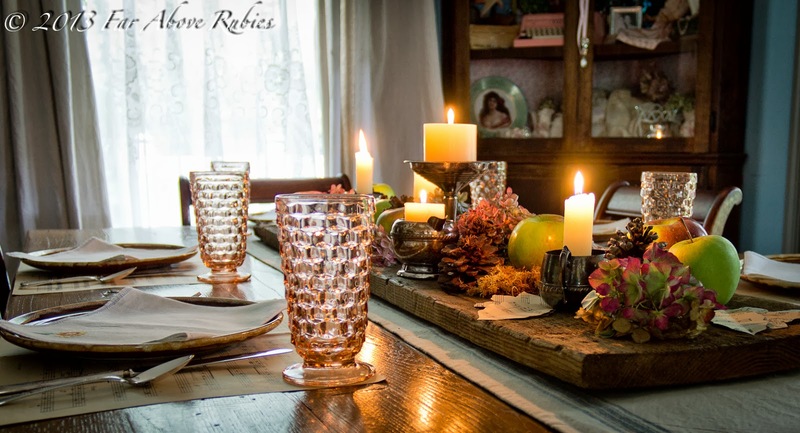 With vintage linen embroidered napkins, peach Indiana Glass "Whitehall" glassware, and vintage Oneida silverplate flatware, "Meadowbrook," the casual setting is complete. 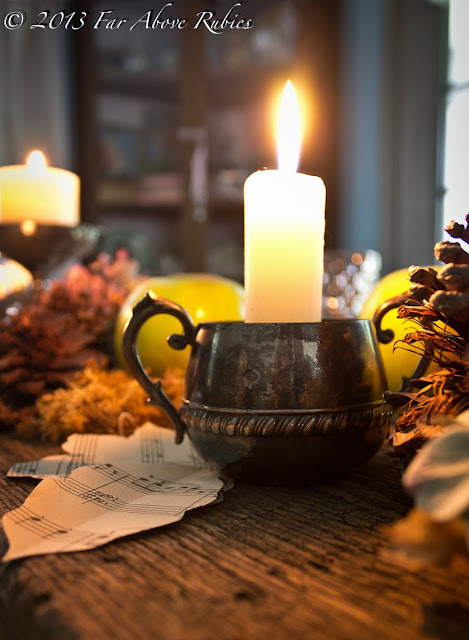 Overcast autumn days are perfect for candle light. I used different sized candles and surrounded them with coffee beans. Please join us on facebook for daily photos from the North Carolina mountains and Blue Ridge Parkway as we enjoy this beautiful autumn season. 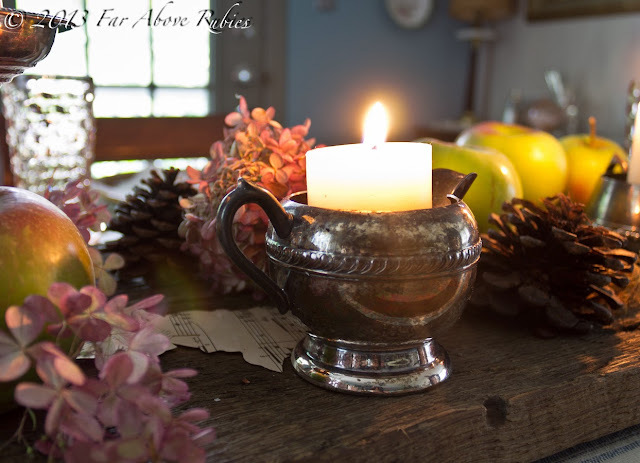 Luv the simplicity of it Anita... simple elements like apples, candles and pine cones with the family silver to add sparkle. The dried florals add the bit of romance needed. Luv it. 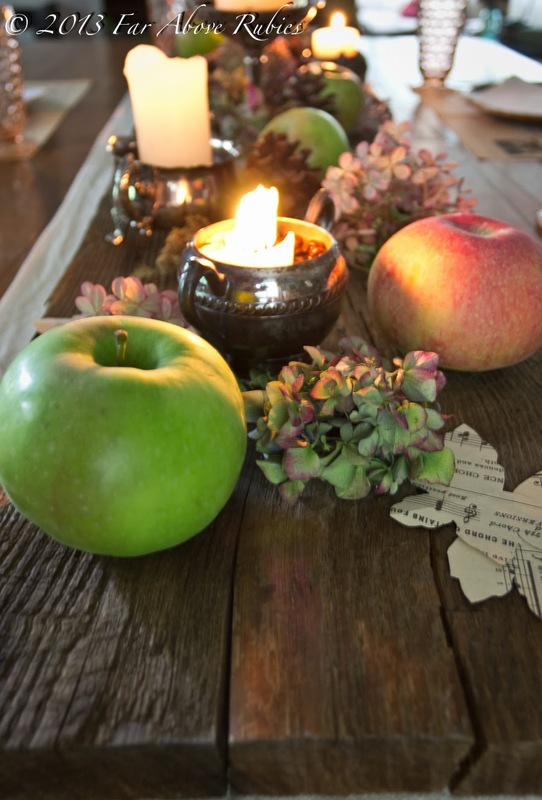 Your use of natural elements always makes me smile, and this table setting is no exception. I can imagine the wonderful scents with the candles and coffee beans. 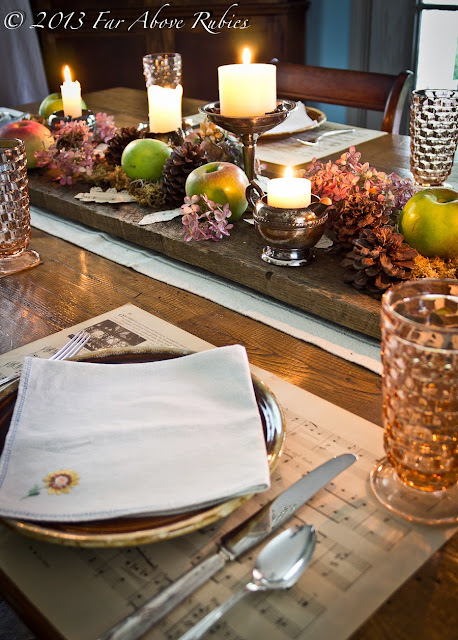 I especially love the sheet music place mats and the musical leaves--simply beautiful. I am loving how you used the music sheets as placemats! It's funny how certain things jump out to each of us. 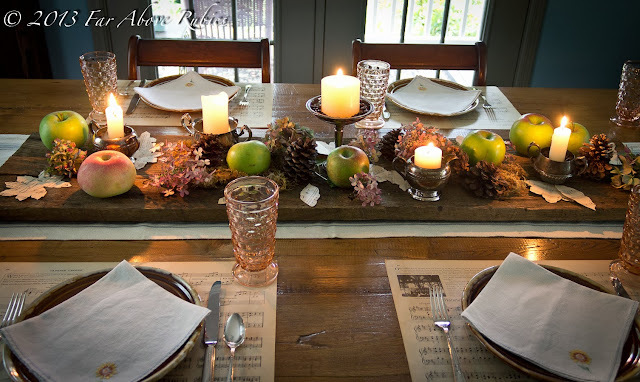 You have such a beautiful talent with making a table setting absolutely gorgeous! Anita, love the rustic with elegant silver. 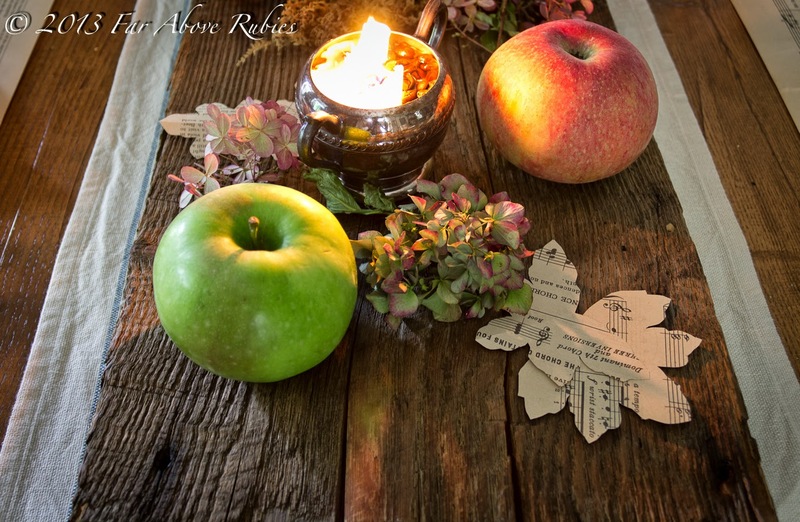 The candles and apples and music sheets are wonderful together. Everything in your table top is gorgeous. This is simply lovely, Anita. I always enjoy your table settings and this is no exception. It would make any guest feel so very welcome. 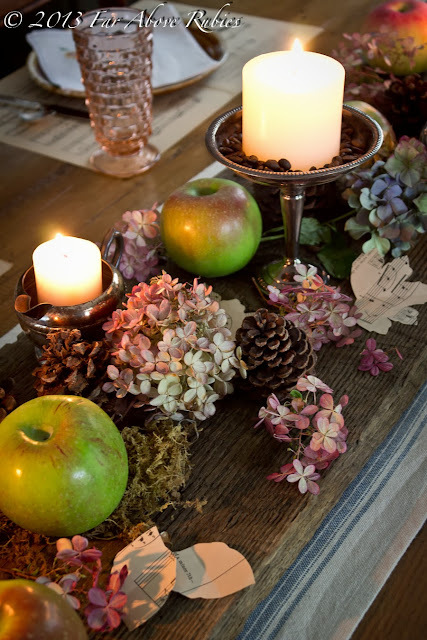 What a lovely autumn table setting! I just love the centerpiece on the wooden board, it looks beautiful! This is stunning, Anita. I love the idea of the wood plank and the SILVER pieces to hold the candles!!! I used to have that dinnerware MANY years ago, when we first got married. Wish I still had it. Your pictures are beautiful. The light in them is perfect for autumn. 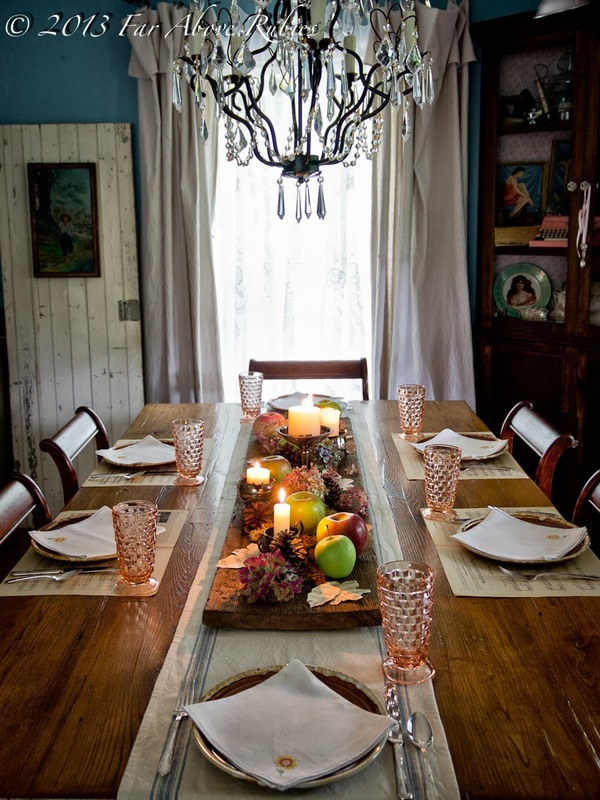 Your beautiful tablescape is going to be an inspiration piece for me down the road. I love how you have combined the plank with the tarnished silver for great texture. 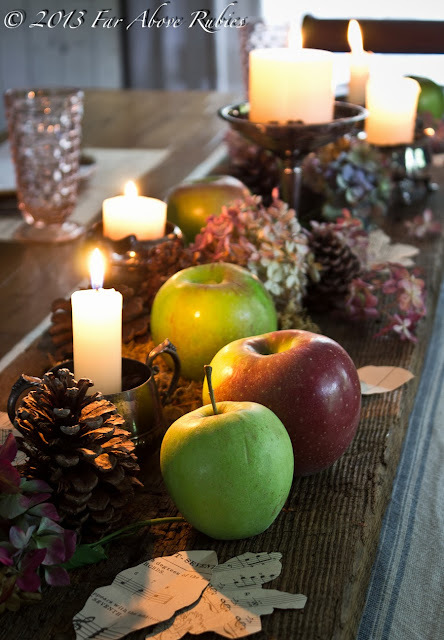 This centerpiece is so simple, yet so elegant. Love it! Gorgeous tablescape! I love the wood centrepiece! It looks fabulous! So pretty! Love the placemats! this just looks so inviting! love the warm wood tones with the candles aglow! 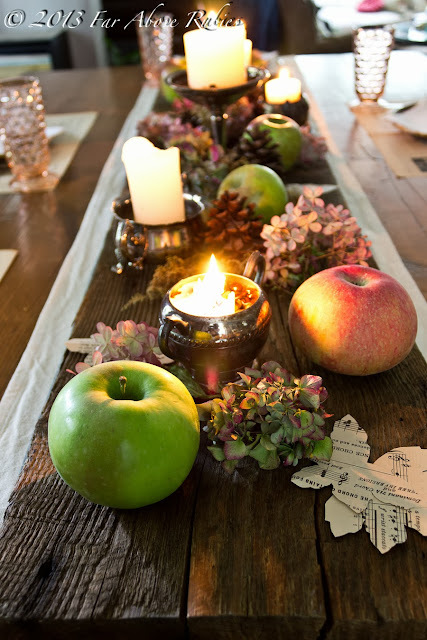 Love the wooden board with the apples, candles in silver pieces and cut out leaves! Your brown plates are lovely with your vintage silver and napkins. Have a great week! 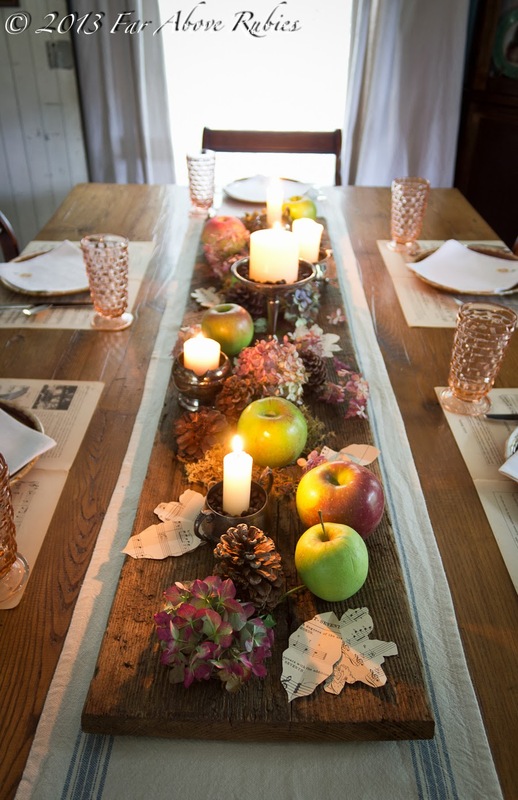 Love the way you've styled the table with that gorgeous wood down the center. The colors and textures of the all natural elements are so warm and inviting, and just right for fall. Fabulous! Thanks so much for linking your gorgeous table, we've featured this week at Ivy and Elephants. Feel free to stop by and grab a featured button.